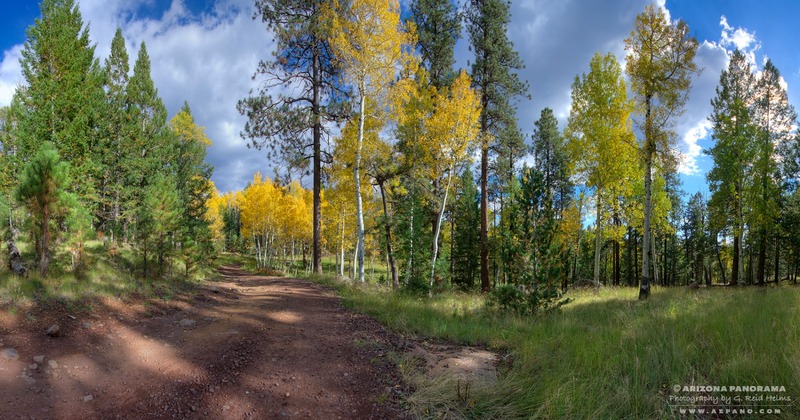 The Friedland and Hart Prairies at the base of the San Francisco Peaks are almost always a good place to go for Fall color in northern Arizona. This year was no exception. Both were my destination on an overnight trip. The second and third week in October is usually the best time. Higher elevations show their color sooner as the Fall action makes its way down the mountain. I decided to pass on Lockett Meadow this year. It was the weekend and I knew it would be pretty crowded with all the other Fall color seekers. A couple miles down the road on the Friedland Prairie, I set my sights on the first aspen showing off. I stopped right away and started making images. The colors were so stunning with the brilliant side-light of the sun. Some nice shadows of the adjacent aspen made for a nice composition. A big mix of colors and textures stopped me again as the road snaked its way through the forest. More action along the road. Sometimes it's hard to figure why a scene stops me in my tracks. Is it a sense of awe and wonder more than what I see with my eyes that makes the difference? I know this happens a lot. Sometimes I get home, look at my images and wonder what I was thinking. Why was this place worthy? Oftentimes, it's not really because of aesthetics, but more the way a place feels at the time. It's something more innate and instinctual feeling. That emotional reaction is what so many other photographers respond to as well. Some places just have more photo mojo than others. Then the biggest challenge is making sense of the ever-present chaos of nature and finding a pleasing composition. Further up the road, I settled on a spot, parked and hiked up the foothills of the Peaks where the aspen were dense and colorful. I took a zillion photos. Again, mostly responding to the wonder of the color. When I got back to the truck, I broke out my bag-chair, kicked back and soaked it all in. 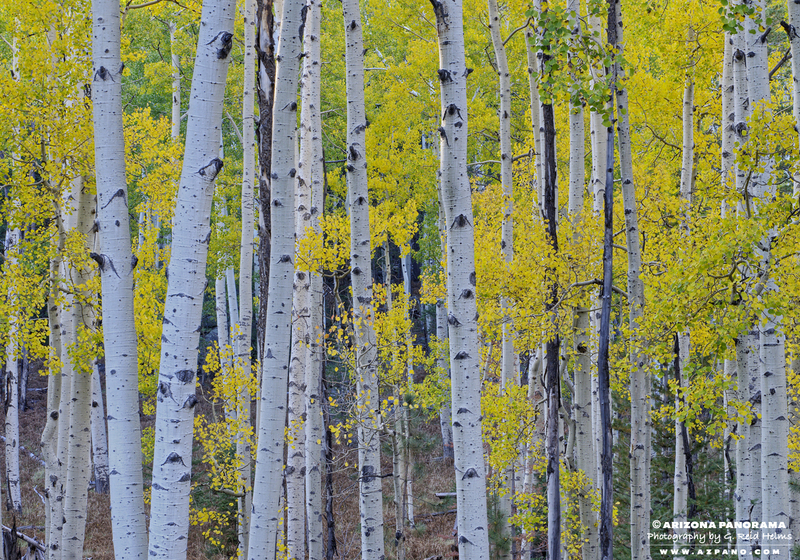 The aspen were in all different stages of color. 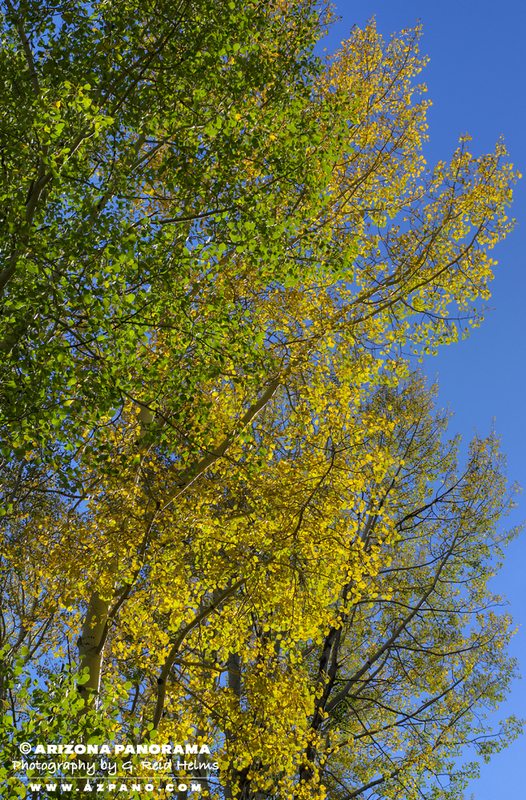 I found one spot with a green, yellow and a, well, spent aspen that sort of reminded me of the Irish flag... with a lot of imagination, I guess. The next morning I headed up the highway to the Hart Prairie. Its another popular spot in the Fall. 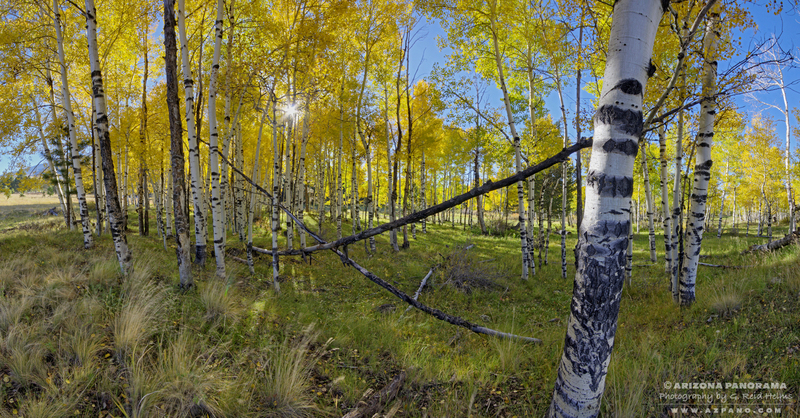 One grove of aspen are particularly photogenic and I've photographed there before. 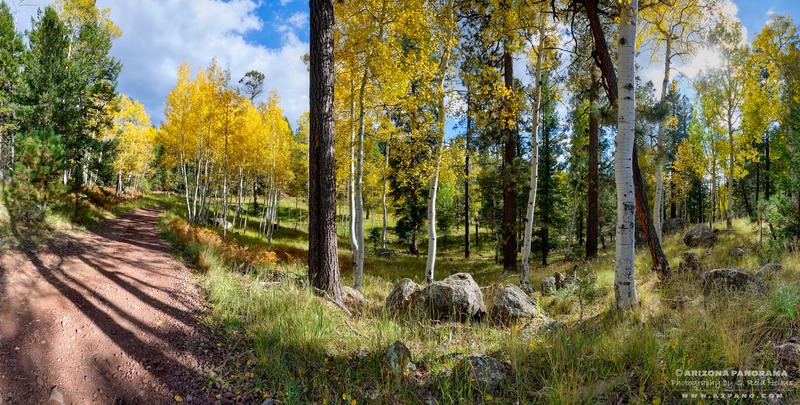 Next time you're in Flagstaff in the Fall, check out the Hart and Friedland Prairies. While most people drive up the road further to the Snow Bowl for their Fall color fix, make that turn off the road and hit Friedland. Hart Prairie is just further up the highway. 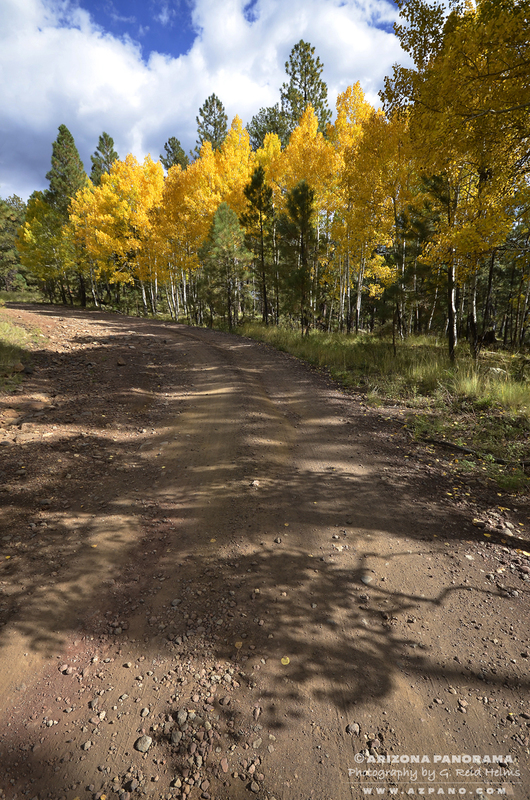 The forest service road is a lovely drive around the north side of the Peaks and dumps out near Sunset Crater and the Lockett Meadow road. If it hadn't been the weekend, I might have gone for the trifecta of the Friedland and Hart Prairies along with Lockett Meadow. Maybe next year.